Screens are the foundation upon which every screen-printed garment is built. Nothing you haven't heard before, right? The ability to manage variables in screen making dictates overall production and workflow. As Don Newman stated years ago, the screen is the mechanism that makes what we do what we do: screen-printing. Frame, mesh selection and stretching techniques are among the very first decisions that will be made in the entire process, and are absolutely critical. But, before all that gets serious consideration, what about their department's basic layout? What about the flow of work? While you can make screens in a closet or bathroom in the corner of the plant, remember: Garbage in/garbage out. Yes, you can make one adequate screen in the . . . uh, can. But not very many, in a consistent and reliable manner, especially if you are printing any kind of challenging photo-realism, process or special-effects images, in any kind of production volume. Resolution, stencil thickness and registration from screen-to-screen are some of the consistency factors that must be achieved for quality, repeatable work. If the basis for successful screen-printed garment production is a perfect screen, then exactly that must be your goal. We have come to accept that, as long as the presses are spinning, we're accomplishing some level of profitability. Conversely, they are only costing us money when still. The purpose of everything else in the plant is in support of this premise: Keep the presses moving. The most expensive parts of our process are tear-down and set-up, and the latter is totally dependent on the screens. With this in mind, the screen-making department becomes a focal point. So what's the most efficient layout of a screen-making department? For starters, do not underestimate the space you will need. I've been all over the world on different projects and would say this is where most folks fall short. I've built screen departments as large as 14,000 square feet, and as small as a few hundred. But when allotting space, you simply must remember the importance of the screen to our process. If you have ever read about or taken any courses on operations or production, you know there are many theories on process and production lay-out. We've come to recognize the screen-making process as a loop, so this is how we want to lay out our department. Much like our industry as a whole, planning the lay-out or floor plan for the screen department contains elements of both art and science. Creative problem solving, as it were. Production flow should be analyzed as well as consideration made to departmental interrelationships and physical applications to minimize potential waste of motion, time, energy and, ultimately, money. Departmental relationships have a direct influence on workflow. Growth potential, equipment placement, total footprint needed as well as lighting, power, mechanical and many other issues must be considered. 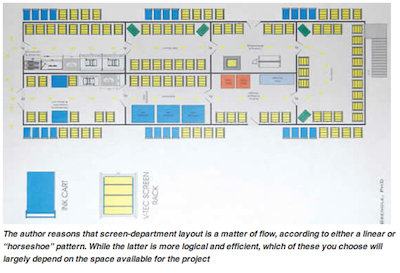 Positioning the art separation, storage and color departments either within the screen-department loop or at least a part of overall production flow is an important factor to consider. The primary objective of the floor plan is to arrange the department in a logical order from beginning to end. Flow is our directional planning tool. There are a couple of ways I like to consider this. The ideal situation, and my favorite, is what would be called the horseshoe approach; the other, a linear approach. Unless you start from scratch and build your own building, the building or space selected for screen making will largely determine which approach is most suitable. On paper, lay-outs often seem too easy. In real life, a few small errors in calculation can cost a fortune in lost productivity. As an exercise, try laying a clear piece of film over your potential floor plan and use red markers to track the movement of screens and the materials to make them. When you are finished, ideally, the arrows should cross only minimally. Try to stay as flexible as possible when placing equipment in the final phases. Lay tape or chalk on the floor before finalizing the location of equipment. If something feels too tight it probably is. Relocate it in the early stages. 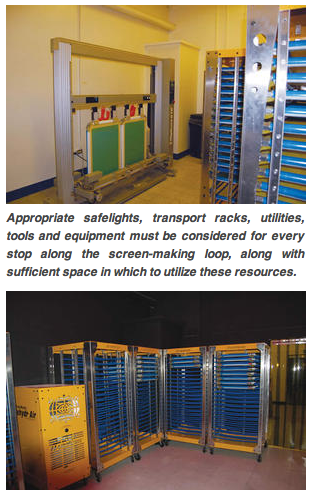 Design considerations should include answers to as many as possible of the following questions: Will the production flow of screens run seamlessly from one operation to the next? Where in the layout should each operation and equipment for the operation be placed in consideration of our process loop? What natural constraints or constrictions (bottlenecks) does the space or building have? What are the atmospheric necessities as far as cleanliness, temperature, humidity control, air exchange and ventilation? What will be the electrical, plumbing, lighting and pneumatic requirements in each area? Will it all fit? Reclamation: tape-removal table, ink-removal sink, stencil-removal sink, degreasing sink (loop starts over here), high-pressure washer, chemical-storage area, staging area, transport carts, electrical requirements, standard lighting, back-light requirements, pneumatic requirements, plumbing requirements, sewage requirements, chemical-transport requirements, ventilation requirements. Another of the more consistent factors from room-to-room that you will notice involve the staging-area consideration and transport carts. Moving the screen from operation-to-operation and room-to-room requires the most fluid movement possible. The doors dividing each department are also important. An easy opening and closing mechanism that holds in or out atmospheric conditions and lighting is key. Before appropriate ventilation can be chosen, one should study emissions of particular products and applications as well as local, state and national regulations. Controlling dust is necessary for all screen printers. When printing on garments (or any substrate), airborne particles are troublesome and clean-room type conditions should be achieved. While this type of loop is designed to maximize productivity and minimize bottlenecks in the process, I would be remiss if I did not mention safety and health. All of the aforementioned conditions mean nothing if the employees are not working in a safe environment. The considerations of escape routs, fire extinguishers, eyewash and first-aid stations are of equal importance. The power feed for all critical equipment-including computer operating systems-should be on separate clean circuits, isolated from the balance of the other electrical equipment. Isolating spikes and outages can protect the expensive equipment in the screen department (such as direct-to-screen units) from damage and disaster. If we arrange our screen department in a logical order-and we are, from the beginning of the process to the end-then we have determined the layout is the process of flow. It is important, because the screen department can make or break the entire process.